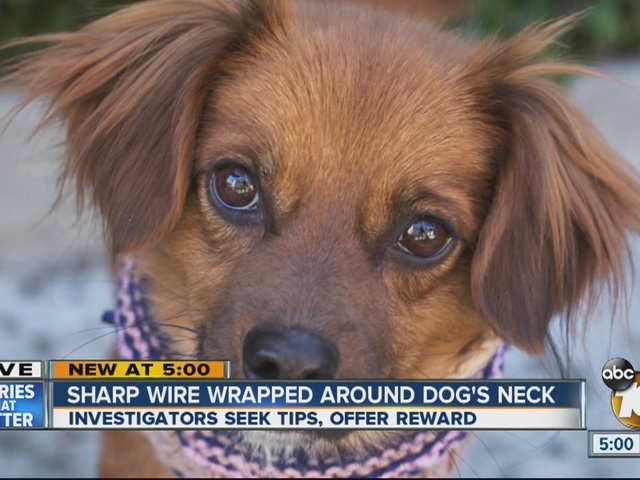 OCEANSIDE, Calif. - A reward of up to $1,000 was offered Wednesday for information that leads to the arrest of whoever wrapped chicken wire around a dog's neck so tightly it cut her to the bone, then abandoned the animal in Oceanside. The 4-year-old Spaniel named Melody was found at a plant nursery on North River Road last week and taken to the San Diego Humane Society on Dec. 22. She was suffering from severe lacerations around her neck apparently caused by the wire. "The way the chicken wire was tied indicates that this was an intentional act," said Steve MacKinnon, chief of humane law enforcement for the San Diego Humane Society. "The injuries she has suffered cut into her flesh all the way to the bone. She's very lucky to be alive." MacKinnon said an investigation was underway, but there's little information to go on. "We're asking the community to please report any information or possible leads so we can find the person responsible, or Melody's previous owners," he said. Melody has undergone reconstructive surgery to repair her injuries and veterinarians have given her a positive prognosis for survival and rehabilitation. Humane Society officials said the canine's painful injuries constitute animal abuse, and they're hoping to pursue felony animal cruelty charges in connection with her ordeal. "What happened to Melody is horrific and, unfortunately, we see animal cruelty like this all too often," San Diego Humane Society President and CEO Gary Weitzman said. "We rely on information from the community to be able to seek justice for these animals who are unable to defend themselves. Fighting animal cruelty is one of our primary missions so we can give animals like Melody the second chance they deserve." Anyone with information that might help investigators with the case was asked to contact Crime Stoppers' anonymous tip line at (888) 580-8477, email a tip to sdcrimestoppers.com, or contact the San Diego Humane Society at (619) 243-3466 or sdhumane.org.